April 2013 Update: It now seems clear that with a few exceptions, Amazon.com’s prices are higher than average, especially when compared to emusic, a service I highly recommend. So I would recommend first becoming an emusic member (minimum of $6 a month) and then take advantage of their discounted member prices which usually stay the same. That said, Amazon.com occasionally has “flash sales” for 1 day only for Top 40 albums. (They can cost 99 cents or 2.99, a pretty good deal). Selected compilation albums can be cheaper than other music sellers — I am thinking of the Johnny Mathis, Edith Piaf, John Prine and some of those trance compilations. But by the time you click these links, these sales may very well have ended. Finally the Big Box series of classical music tend to have amazing 99 cents sales — although they rotate the sales. Click this link to see which Big Boxes are currently on sale). First, I should announce that I am working on an ebook about collecting digital music which I expect to publish in early summer 2013. I have been researching lots of stuff about that. How do you stay within a budget for music purchases? How do you discover new music without letting the major music studios dictate your tastes? How do you find the classics for a low cost? These are the topics for the ebook. At the moment, digital music is so arbitrarily priced that it’s next to impossible to figure out how much you can and should pay. About 95% of the digital music selling on Amazon is a rip off. By that, I mean that the music is good, but you can still find the CD for significantly cheaper. At the same time, some smaller labels and band “get it”. Instead of trying to sell all albums for 9 or 10 dollars, they sell it for $5 or $6 or $7. And guess what? I almost always buy it at that price – especially when it’s a “Greatest Hits” or award-winning album, or something like that. Here’s a list I am compiling of great digital deals. Francophonic (Volume 1). 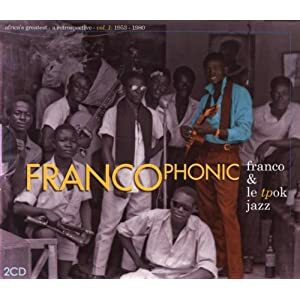 Classic 2 CD collection of Congolese jazz guitarist Franco. This is not cheap at $17.98, but easily the best thing I had bought over the past decade. Volume 1 (i.e., Thin Franco”) covers up to 1980, while Volume 2 (i.e., “Fat Franco” ) covers 1980 to his death in 1989. With many African performers, you don’t have lots of cheap CD’s floating around, so you end up having to pay a premium price for recordings (digital or physical). I am saving my money for Volume 2! But Volume 1 is certainly enough to keep me happy. Sonny Rollins: Night at the Village Vanguard. A 2 CD collection of a classic live performance (mp3s for sale at $10). One of the most famous jazz recordings ever. Best Of Trance 2011 – 99 Tracks. 11 hours of music for $9! I usually hate those mega-collections of trance music. A low percentage of them are good, and sometimes the album only includes shorter edited version (which can often be frustrating). This collection is above average for Trance compilations, plus there are no edits! I’m listening to it now, and so far, I haven’t heard a bad track! Best Of Bonnie Raitt On Capitol 1989-2003 I am only a so-so fan of Bonnie Raitt, but this compilation is really great and for $7 you can’t miss it. Nigeria Special: Modern Highlife, Afro-sounds & Nigerian Blues 1970-6. For $12 you get 115 minutes worth of rare tracks . All amazing and intoxicating stuff. John Prine, Singing Mailman Delivers. For $8 you get 2 CDs worth of early songs by a classic folk singer who has been generally overlooked. I’ve only started listening to this guy, but it surely will be great. Johnny Mathis. Fifty Favorites. For $7 you get 50 tracks from the early period of Mathis (when he was still amazing). Dexter Gordon, Go. The problem with collecting jazz music is that almost all of it is good, but very little of it is outstanding. Also, people like Dexter Gordon record over a 100 CDs, so it is really hard to know where to start. Fortunately this album is one of the best and acclaimed by all and accessible and only $6. London Suede is an eccentric post-glam British band. 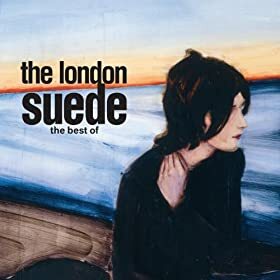 Best of the London Suede contains 35 songs (certainly their best) for $9. I knew the band other from only one or two songs, but once I listened to their entire album, I saw how high quality and overlooked they really are. Benny Goodman Famous 1938 Carnegie Hall Jazz Concert. ($7) Various producers have tried to fix the audio problems of this concert (and generally I prefer the original Columbia/Legacy recording for $17 ). But the budget edition I linked to sounds good enough and is substantially cheaper and has almost all the same tracks (minus a few). For $7 you can have a passable version of this dynamite concert. DJ Tiesto, In search of Sunrise 4 Latin America. All of the ISOS albums are on Amazon and each cost about $9. This one is supposed to be his best mix and contains 6 1/2 hours of Trance Music. Beethoven Symphony #9, conductor Andre Cluytens, Berlin Philharmonic. (Only $3.50!) Third Ear Classical Music Guide ranked this as the best version of Symphony #9, and I agree. Slender, lively, just perfect. Note that Joseph Krip’s complete Beethoven Symphonies is on mp3 for $7 total. That’s awesome! I listened to these recordings. Good, middle of the road interpretations, although I thought #3 and the even numbered symphonies stood out. Edith Piaf. 100 Hits! $4.29. Pretty amazing and comprehensive collection. I’ve only listened to the 1 CD compilations, and I look forward to listening to this one. Doo Wop Classics. $7.99. I didn’t buy this album, but I own a similar 2 CD set with almost the same playlist, and I can say it’s amazing. This album has 64 songs totalling 192 minutes. Trust me. This one is going to be a winner. Andrew Sisters. Swinging with the Andrew Sisters (27 Hits). $5.99 Andrew Sisters is my all-time favorite band, and I can officially bless this $6 collection as being an awesome deal which includes some lesser known Andrews greats. Amazon has a good way of letting you browse the cheap mp3 titles. Here is their Editor’s Picks for albums for $5. Here is their list of greatest hits under $8. Keep in mind that these low cost editions (even the compilations) may not necessarily be the best deal for your money. Often there is a better compilation which consists of 2 CDs but can often be purchased for only 2 or 3 dollars above the single CD Greatest Hits. Don’t believe me? Ok, Supertramp’s Greatest Hits is for sale as mp3 for $7, but the later compilation CD Retrospectacle sells for $8 on half.com for $3 shipping (or less if you buy multiple items). Best of Talking Heads sells for $5 on Amazon (a great deal), but Popular Favorites 1976-1992: Sand in the Vaseline by Talking Heads (a better 2 CD compilation) sells on half.com for $2 plus shipping. (The same 2 CD compilation sells digitally on Amazon for $17). Just recently, I was going to buy an mp3 compilation of George Benson’s jazz music for $6 , when I discovered that a better collection (with twice the number of tracks and better quality overall) was for sale as a CD for $4 + $3 shipping. Two other notes. Google Play has become a big deal in selling mp3s. Every few weeks they feature steep price cuts from major music labels. Most of it is the same old garbage for 6 to 7 dollars, but last summer they featured about 100 great classic albums for $3 or $4. That’s enough reason to keep me looking at their promotions. What about other places to buy music such as from the musician’s own sites? Usually that is not a good proposition because most musicians are not good at the buying and selling thing. Plus one condition of selling on Amazon is that Amazon can automatically meet or beat the price of any other place the album is being sold. So there’s a built in incentive for musicians not to try to compete with Amazon. On the other hand, one reason you should still check the musician’s website is to see if they have set up in other stores which provide a bigger percentage of the profit for artists. Bandcamp, for example, is supposed to give greater share of the royalties to artists than Amazon – if only fans would buy from them! I have long been a proponent of creative commons music – which is as good as if not better than commercial music. See my picks about the best free creative commons albums to download and my free download links to Benny Goodman mp3s on archive.org. Finally, a request. I will try to add and subtract to this list of deals as I become aware of them. If you know of a great “deal” on a musician, feel free to jot it down in the comment section. (I may not like every musician, but the better the deal, the more willing I am to take a chance. During last summer’s Google Play deal, I ended up buying for $2.99 a Duran Duran CD and a John Cougar Mellencamp album. Both were excellent albums, and well worth the $3 for the digital download. Believe me when I say that I never could have imagined myself spending more than $3 for either album. Update: I’m going to mention several outstanding music references. First, 1,000 Recordings to Hear Before You Die by Tom Moon which is probably the most outstanding musical reference out today. (Here’s his weblog and a weblog by a fan of the book) . Second, Robert Christgau’s rock criticism (an invaluable reference) and Acclaimed Music (a Anglo-centric book of musical lists).